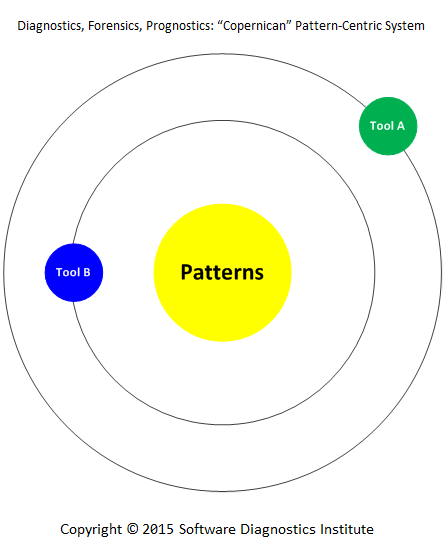 Our pattern language system for software diagnostics was originally tool-centric, devised from recurrent analysis problems on Windows platforms when using WinDbg from Microsoft Debugging Tools for Windows. We now call it “Ptolemaic”. Later we realized that the same system is possible to apply to other platforms and tools, and we proved it with the publication of the book for GDB. When the debugging tool changed on Mac OS X we ported the same book to different LLDB debugger. With the presenting of a pattern language for memory forensics, we extended the same system to other memory analysis tools in principle. Our pattern language system became pattern-centric. We call it “Copernican”. In addition, trace and log analysis pattern system was devised as pattern-centric from the ground up based on software Narratology and applied to all software execution artifacts including network traces. 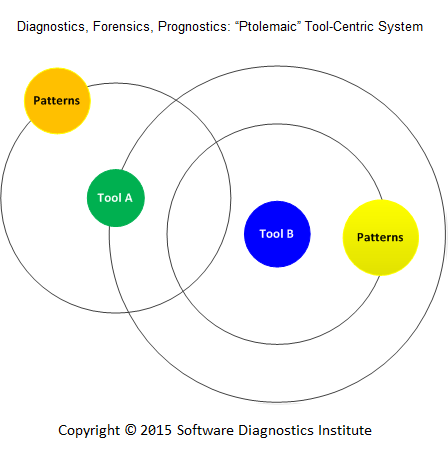 Although this paradigm shift was evolutionary for us, we call it revolutionary for the whole discipline of software diagnostics, forensics, and prognostics because of previously dominant tool-centric systems.